The image on the front page of The Miami Herald the day after the shooting. On April 11, 1986 eight FBI agents engaged in a lead slinging war with two criminals, and despite outnumbering the crooks by four-to-one, ended up losing two of their own in a debacle that changed both tactics and the choices of firearms for law enforcement as a whole. Michael Platt and William Matix were no good, despite not having a criminal record before they began their crime spree that ended their careers and lives. The two met while serving in Fort Campbell, Matix having been a former Marine before enlisting in the Army. Platt was a Ranger. Strangely enough, the wives of both men died under strange circumstances, but neither was ever charged with any crime. The two men began their crime wave by murdering 25-year-old Emelio Briel while he was target shooting on Oct. 5, 1985, and stealing his car. Over the next six months Platt and Matix began a spree of bank and armored car robberies, wounding two guards. 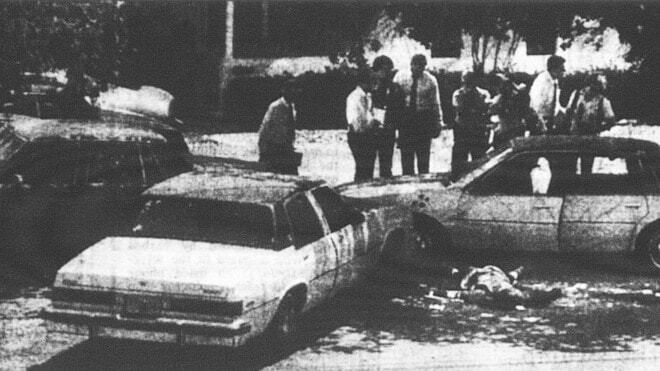 On March 12, 1986 the two shot Jose Callazo, severely wounding him and stealing his black Monte Carlo. A week later Platt and Matix hit another bank, but their car was noticed and their fate was sealed. On April 11, 1986 a team of 14 FBI agents, with Special Agent Gordon McNeill in charge organized a rolling stakeout looking for the black Monte Carlo, they had no idea who they were looking for specifically, and they certainly had no idea what they were about to come up against. Divided up in eleven cars, only eight agents actually were involved in the whole event. Around 9:30 am, Agents Ben Grogan and Jerry Dove spotted the Monte Carlo and began tailing it. Two other cars joined in and tried to pull Platt and Matix over. After several tries to force the Monte Carlo over, one good shove pushed the getaway car nosefirst into a tree with a parked car blocking the passenger door and Special Agent Richard Manauzzi’s car blocking the driver’s side. Unfortunately playing bumper cars with Platt and Matix had caused problems for the agents as well. Manauzzi had placed his Smith & Wesson .357 on the seat next to him in anticipation, but the sudden stop sent it flying, he was now unarmed. Ben Grogan’s eyeglasses were also sent flying, which he needed to see with. He was now nearly blind. All hell broke loose when Matix opened fire with his 12-gauge shotgun followed up by Platt who let loose with a withering fire from his .223 Ruger Mini-14. Manauzzi took one of those .223’s to his right side before diving out of his car as his passenger side door—only inches from the bad guy’s Monte Carlo. Platt who was in the passenger side of the car and firing across the front of Matix out of the driver side window soon came under fire from Grogan, despite being legally blind without his glasses. Matix tried to open the driver side door as Grogan got off nine shots from his 9mm Smith & Wesson while Gordon McNeill began firing his Smith & Wesson Model 19 loaded with 158 grain .38 Special +P’s. One of Grogan’s shots hit Matix in his right forearms cutting the ulnar artery. As Matix slipped back into the car one of McNeill’s .38 rounds hit him in the head below the right temple. Another of McNeill’s shots hit Matix in the neck as he lay slumped over the car door. After he fired off a full cylinder McNeill took a .223 round to his shooting hand. McNeill then retreated to his car, while he was in the process of trying to reload he took a .223 from Platt’s Ruger to his neck that knocked him out of the fight. Agents Edmundo Mireles and John Hanlon meanwhile had gotten into the fight as well. Hanlon had also lost his primary gun during the crash and was now using his Smith & Wesson 36 snubbie. Mireles was carrying a Remington 870, but as he came up behind McNeill before his hand wound Mireles took a .223 to his left forearm, now leaving him to fight with one hand. Platt’s .223 was taking a heavy toll on the agents. Platt was able to get himself out of the crippled car, but it came at a cost, Dove was able to hit Platt in the chest with a 9mm round which was later found only an inch from his heart and it collapsed his right lung. Agents Gilbert Orrantia and Ronald Risner had also entered the fight from cover with their 9mm and .357 (also loaded with .38 +P’s) respectively, firing dozens of rounds at Platt. Platt was hit twice more by Dove, once in the thigh and the foot, and once in the back by Orrantia but he was able to still stay in the fight. What Platt did before was nothing to compare to his reign of terror once he got free of his car. He drew his Smith & Wesson .357 Magnum and began returning Orrantia and Risner’s fire. Platt took a hit to his right forearm causing him to drop his revolver. Platt now turned to face Grogan. During the next few confusing seconds Platt fired in Orrantia and Risner’s direction, and it was here when McNeill sustained his neck wound, Hanlon after shooting his .38 dry, was shot in his shooting hand. All this was done by Platt shooting his Mini-14 from his weak hand. Platt now closed on Grogan. Platt shot Grogan in the chest, killing him. Platt then shot agent Hanlon in the groin, but did not kill him, even though he could have. Platt instead killed Dove by firing two shots in the agent’s head. Dove died instantly. Platt then tried to get into Grogan’s car when Mireles opened up on him with his Remington. Five rounds of 00 buck hit Platt in both feet but he stayed on his feet. Remarkably Matix woke up at this point despite his wounds. He crawled to Grogan’s car unseen by the agents who were concentrating their fire and attention on the wounded but still lethal Platt. Matix slid into the Grogan’s car, in no condition to put up a fight. He was joined by Platt who tried to start Grogan’s car but his wounds began to catch up with his body. Mireles drew his .357 and then moved to the car. Approaching the driver side he fired all six rounds into the door. Platt was struck in the back then as he turned to face Mireles was struck above the right eye and once in the chest, Matix took three shots in the face. The fight was over, and Platt and Matix were dead. In a only four minutes a staggering amount of rounds were fired, over 125. Platt was struck 12 times and Matix six before they were finally put down. Both men had no alcohol or drugs in their system. What came out of the shooting was the FBI abandoning the revolver because of its difficulty to reload under fire, and with it both the .38+P load and the 9mm for the agency. The Bureau first went to the 10mm but found agents were having trouble qualifying with it so the .40 S & W was conceived, which has now proved to be popular due to its performance. The Miami Shootout has become a bitter training lesson that has resounded through the law enforcement community. The tragic events of April 11, 1986 in Miami have led to better guns and better training, but at the cost of two good agents.